We had a busy and fun weekend. 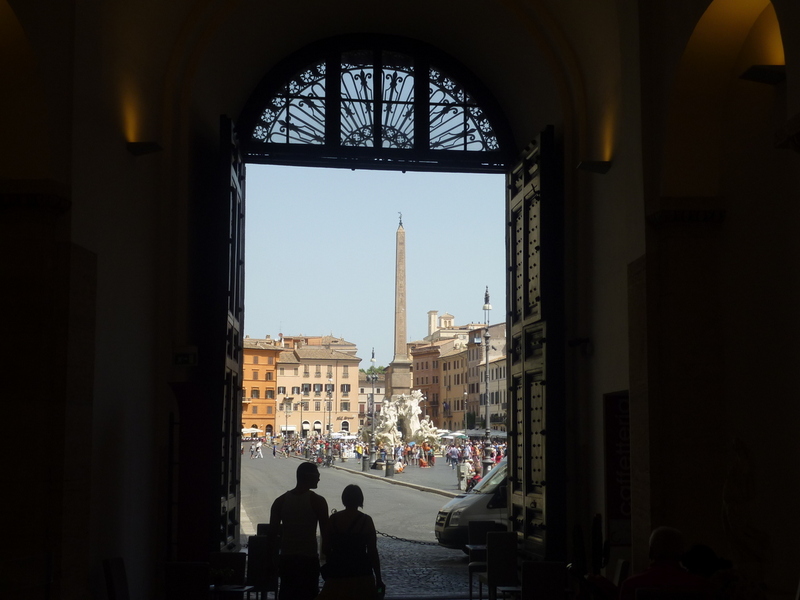 While some would cower in air-conditioned comfort, we headed out to experience more of Rome. The key is to go early, come home by noon-ish, then back out at night. There’s too much to do in Rome in the summer! 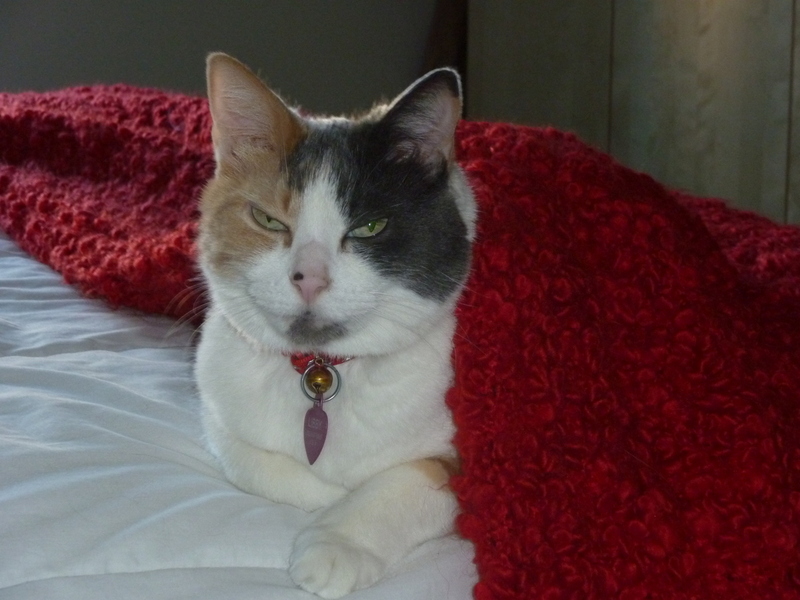 You can’t curl up under the covers like LibbyJean! 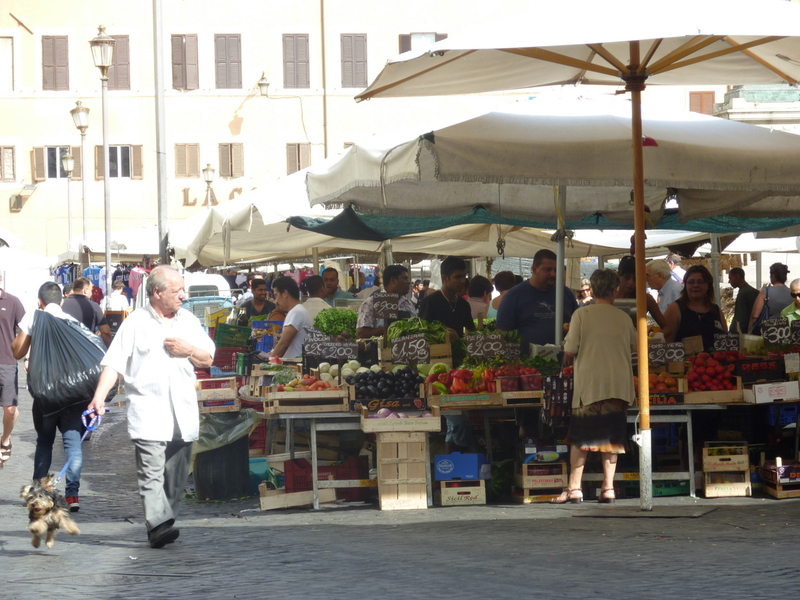 Saturday we always go to Campo dei Fiori, a busy busy market almost any day of the week. We love the bustle and hustle, and access to the best salumi in all of Rome: Antica Norcineria Viola. Unfortunately now closed for ferie, so we have to make do with our stockpile until he returns in September. Beautiful vegetables and the best salumi in Rome. 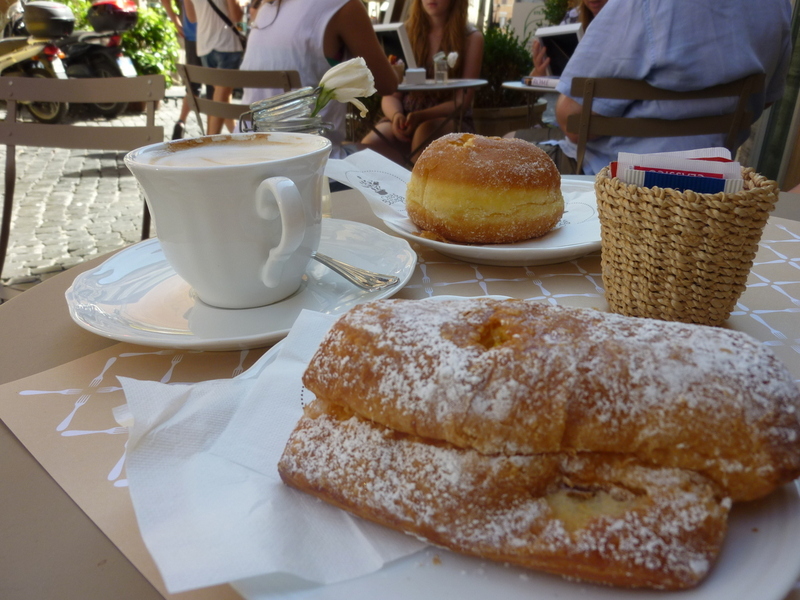 We also had our usual cappucino and pastry, this time con mele e crema, near Santa Maria della Pace. 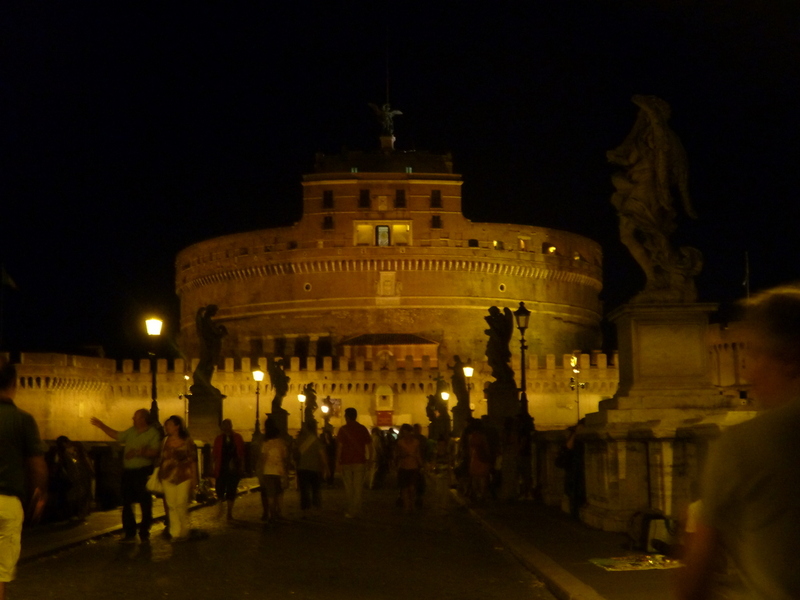 Saturday night, after dinner at our favorite little trattoria, we ventured to Castel Sant’Angelo for Notti d’Estate (Summer Nights), and a special tour including the Passetto di Borgo (secret passage allowing the Pope to escape if the Vatican was sacked — and it was), prisons, and the bathroom of Clement VII. The English tour, for which we had reservations, was at 22:45. We were there by 22:00, looked around a bit, and then waited for our tour to be called. At 22:50 I asked “When will the English tour start?” Madam it has already left! We never heard or saw anyone claiming to be an English tour guide…. So we joined an Italian tour and vowed to return later this summer and pick up an English version so as to get all the details. Lucky for us, tours continue into September. And with the lovely nights we have in Rome, it will be a good excuse to stay out late once again. We were able to climb to the ramparts and look down on the Tiber River, the crowd in front of the castle, and the gorgeous moon over Rome. Playing with water: fun for kids of all ages. 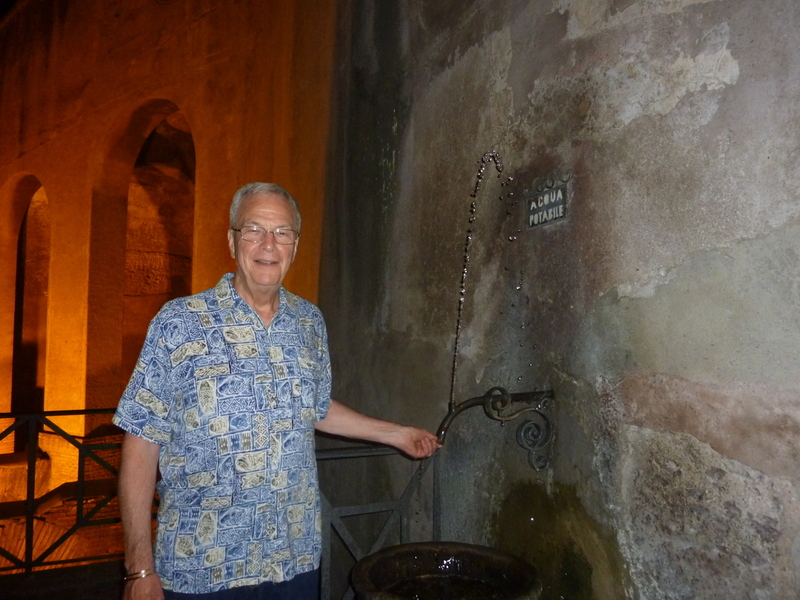 There are “nasone” and other little drinking fountains like this all over Rome. Ric demonstrates his technique. Block the flow with your finger creating a stream to drink from. It really was a gorgeous night. The river was still and Rome glowed like it was lit by torches. That’s St. Peter’s Basilica on the right in the picture. 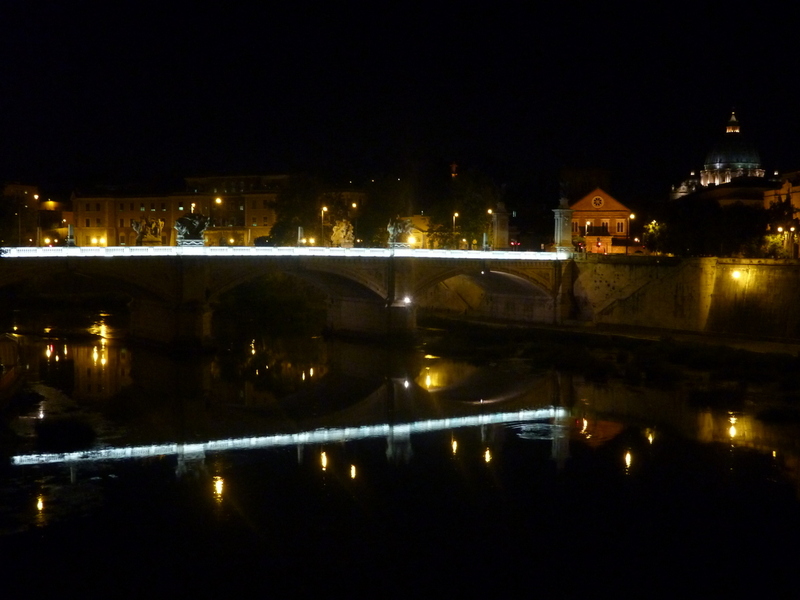 Bridge reflected in the Tiber; Basilica San Petro on the right. Featuring many scenes of Rome as painted during the Renaissance, it is fun to see how things looked to the artists of the time. 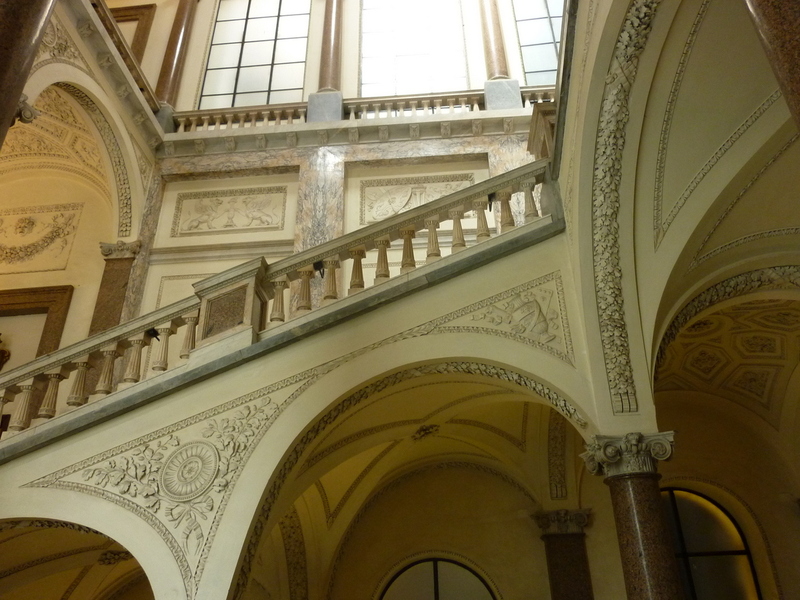 Palazzo Braschi was the perfect stage for its collection. 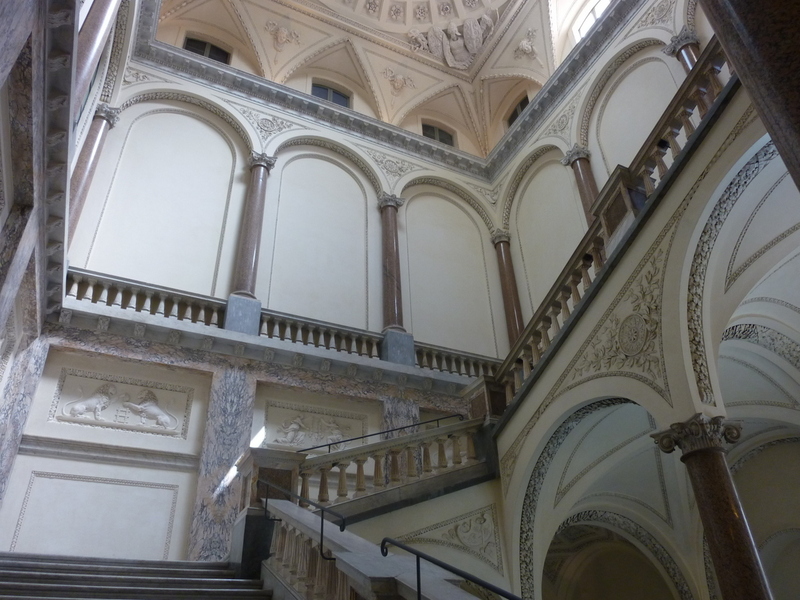 The massive staircase was like an Escher painting. 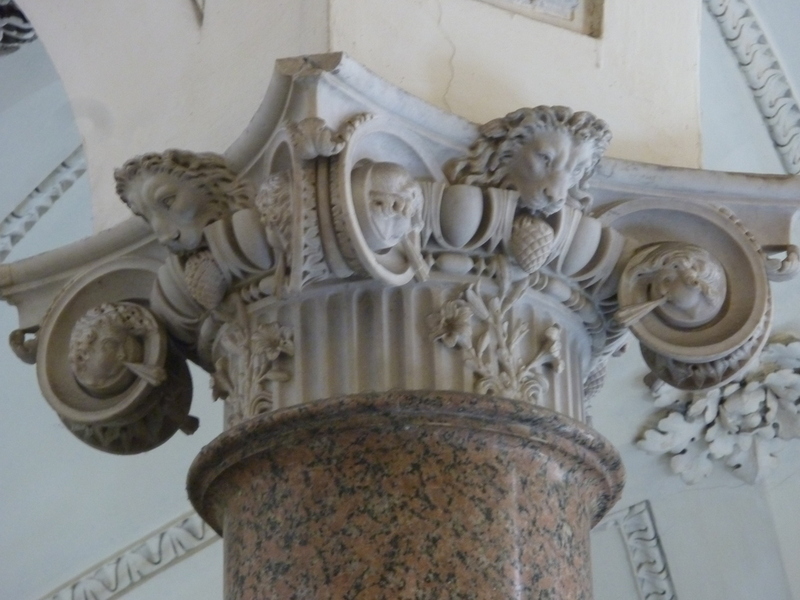 This captivating capital crowns one of the many red granite pillars and is typical of the amazing detail in Palazzo Braschi. Fabulous detail throughout, this captivating capital is typical. Residents of Rome get a reduced price, and those residents over 65 with a Carta d’Identia get in free. (There are reductions for residents at many attractions.) We had the place almost to ourselves. Once you have seen the Vatican Museums, the Capitoline, and the Borghese, it’s nice to avoid the huge crowds and escape to one of Rome’s many lesser-known sites. You never know who you’ll see in a museum. 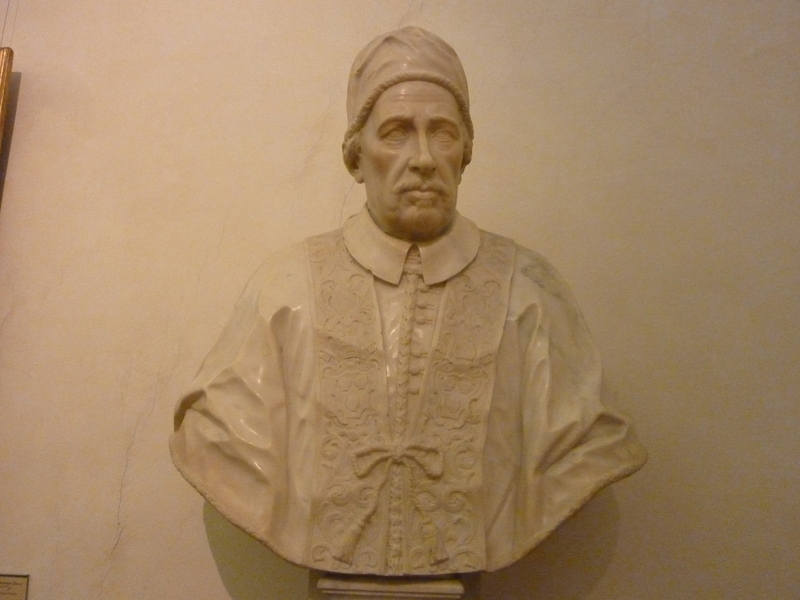 We thought this papal bust looked like Vincent Price. Palazzo Braschi exits right onto Piazza Navona. Sunday afternoon we spent at home, and after sunset, a gelato outing capped the weekend. Perfect! My own little tour guide of Rome! Love spending time with you. Fabulous photography! Keep sharing. So nice to hear from you! One day you will visit and we will stroll that beutiful bridge together with the kids. Gorgeous pics, as usual. Love seeing them. The architecture is truly beautiful. So have you gotten a feel for how Romans view the current Olympics? Do they have it on TV all the time and are obsessed about it like here? Thanks Anita! Ric and I just got our European TV this week and don’t even have the cable working yet, so we aren’t seeing the Olympics! Very annoying! I can’t tell the personal level of obsession with the games, except to say everyone at works comes in buzzing about some aspect: a win, a disqualification, a record set! OF course the Italian papers reflect pride in Italian athlete’s successes/performances with cover photos every day. Good Morning from Portland! What a nice way to enjoy my first cup of coffee, looking and reading your post. All the pictures and narrative are so great and educational for me! Thank You! LibbyJean looks like she has living in Rome down just pat! After a Saturday in the 100’s and a Sunday in the 90’s, I’m looking forward to the temps dropping some around here. It will remain “summer” tho!